NOTE: To view or print the booklet, which contains instructions plus tablature ("TABS") of all the original tracks of tunes, songs and exercises, you will need access to a computer whch can read standard CD-ROM discs. ditional sample song illustrating the style. 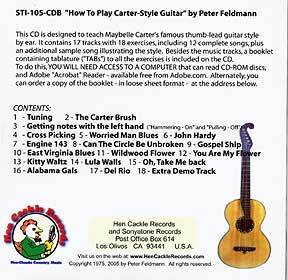 Besides the music tracks, a booklet containing tablature ("TABs") to all the exercises is included on the CD for you to print out and study. System requirements - please READ this before ordering! I just received the Carter picking book in the mail today. It is absolutely fantastic. I knew most of the basics before but I could never put them together and arrange them into a song they way I hear other people do. I have been taking lessons for two years and I could never get my teacher to show me about the things that are in this book. I have already mastered worried man blues after a half hour. Hopefully, I will be able to sing while playing this style after awhile. I feel like I have have jumped to a new level of playing in just one day. Not bad considering I paid $30 an hour for lessons and wasn't getting anywhere after I learned the chords, scales and other basics. So much for music theory, if you are unable to apply it. I am so glad that I stumbled onto Carter picking and your web site. 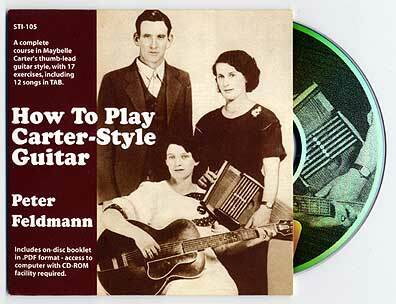 Contents: 18 tracks of exercises and sample songs, broken down into short phrases with pauses. This time-proven teaching technique allows you to play along with the sample in "answer mode", one phrase at a time, and quickly build up your playing skill. Notes with the Left hand: "Hammering-On" and "Pulling-Off"
On-line Purchases accepted via PayPal (below) or by check or money order, payable to "Blue Dalmatian Productions". Price is $19.50 plus $2.50 shipping / handling. Calif. residents, please add $1.51 sales tax. For mail orders, our address is: Peter Feldmann, P.O. Box 614, Los Olivos, CA 93441. If you include your e-mail address, we'll send you a note when your order is received.